Aimé Césaire died on Thursday, 17 April, 2008, in Fort-de-France, Martinique. Aimé Césaire was a poet and politician from Martinique whose influence in Caribbean philosophy and literature centered on the idea of “negritude” was as inestimable as it was transcontinental in spread. Césaire was a committed anti-colonialist and one who sought to cultivate pride in non-European heritage in the Caribbean, a movement that has inevitably informed and shaped some forms of indigenist thought in the region as well, even as in some territories it drew upon the indigenous experience as one parallel to that of Africans in the Caribbean. His Discourse on Colonialism, originally published in 1950, remains a vital text that has been through numerous reprints, translations, and republications. He was born on June 26, 1913, in Basse-Pointe, Martinique, and was mayor of Fort-de-France from 1945 to 2001, apart from a one-year break in the mid-1980s. 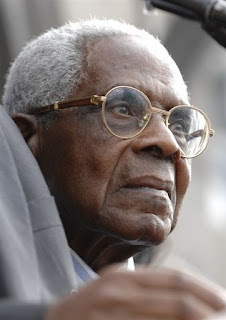 A former communist, Césaire served with the Socialist Party in France’s National Assembly, where he served from 1946 to 1956 and from 1958 to 1993. France’s latest president, Nicolas Sarkozy, attempted to introduced a bill in 2005 that cited the positive role of colonialism, which Césaire stoutly opposed and which eventually led to the language being removed from the bill. God rest Césaire’s eternal soul and may his illuminations continue to guide us.